What do you think when someone mentions Christmas & summer holidays? I know my mind goes to lazy days spent at the beach, BBQs, warm balmy evenings that go on forever. An audible sigh of release. Relaxation, a chance to recharge and reconnect. Then you remember you are a business owner, you have the lead up to Christmas to get through first, and that ‘ can almost taste summer’ feeling quickly evaporates. Not only are Christmas Cards a tradition, it is a great way to thank the recipient for their business and to let them know they are important to you. But there are some do’s and dont’s to keep in mind. Write a warm meaningful message, also if you are aware of their religious beliefs tailor your message according. Send it on time. You can refer to Australia Post’s website for cut off times. Allow for postal delays at that time. Whether you are flying solo or have a team, organising something out of work to mark the end of the year is a great way to close the year and prepare for the next one. We have spoken before about hack days which you can read here. But basically organise a day where you can set out your Marketing plans for the new year, your business goals, the strategies & steps you need to take to achieve those goals and schedule, what needs to be done by when and by who. If your busy time is now onwards plan this for Jan-Feb when quieter, but still plan for it, book the space, tell the people, make sure it happens and you don’t get busy with “catching up on things” in the new year and have it fall by the wayside. Not only will you go into the holiday season with peace of mind but you will feel invigorated to start the new year if you have a plan. Thankfully these days there are many applications that enable you to schedule in advance. Then there are the Hootsuite & Buffer applications that help you manage all facets of your social media activity. Ideally you will want to schedule “evergreen” content rather than topical content. If Pinterest is a big part of your business you can use applications like Tailwind or Viral Tag to schedule your pins. It also optimises your pinning times. If you send regular emails to your clients then you most likely have an email marketing service such as Mailchimp, if you do, great news you can schedule your newsletters to pop into your clients inboxes, connecting with them while you are sipping cocktails by the pool. Does your website need a refresh for the holiday season? Do you social media channels need a refresh, change the cover images to something more appropriate? Just remember to keep it consistent. Don’t confuse your audience by looking so different they don’t recognise you. 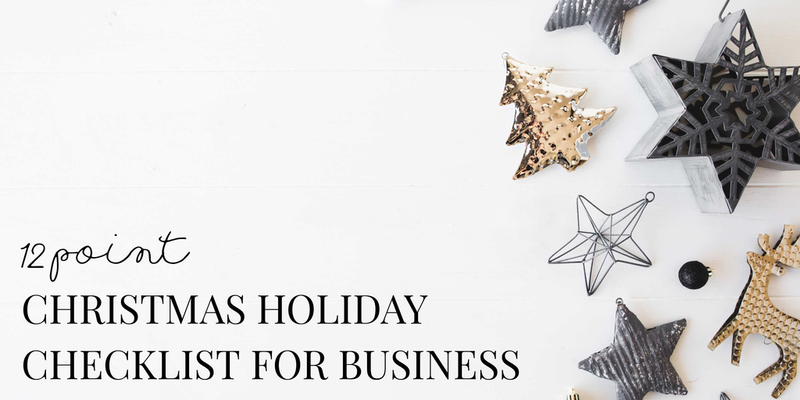 Could you use the excitement of Christmas Holidays to run a promotion, a giveaway, an event? This is an opportunity to connect with your customers and or clients, “to give something back”, don’t do it for the sake of it as there is always a lot happening for everyone at this time of year. Perhaps scheduling in something for the new year for everyone to look forward to might be more appropriate for your business. Either way if it is appropriate, go for it! While we are talking money, are you up to date with your invoices? Have you paid outstanding invoices? You will be in a much better headspace if you KNOW what your finances look like. Save your sanity. You don’t want a full inbox, you may think while you are on holidays that you will keep an eye on your emails, but you will be surprised. Holidays are fun, checking emails is not so much. Switch off and enjoy your break but before you do, review the emails you are subscribed to, did you sign up just to get that lucrative opt in goodie/competition/giveaway? Will you read the emails when you are back in front of your computer? If the answer is yes, in outlook you can set up a rule and direct it straight into a folder for review later If the answer is no, unsubscribe (and you can let them know the reason why, some clever email applications let you unsubscribe for X period of time). You can also use Unroll me a mass unsubscribe from email lists to help with the process. If the thought of this is overwhelming and you use gmail you can use Away Find a free Gmail plugin that monitors your email inbox for important messages and only notifies you by a SMS text message if an email is absolutely urgent. If you are going away, it might sound obvious, but you would be surprised at how caught up you can get at this time and fail to let people know. An easy way to do this is to add it to your email signature. Also the more you tell people the more exciting it is for you and less likely you will get urgent/emergency calls or emails while you are off. Do you need all hands on deck over this period or can manage on skeleton staff? Even if they haven’t put a leave form in yet, it is best to check what people’s movements will be like over the holiday period, perhaps you know someone will be working hard up until Christmas Eve, then if you don’t require them after that, give them a few days off, they will really appreciate it and come back refreshed and recharged ready to work even harder for you. Likewise, if you know they are likely to be flat out in the new year, give them some time off before, so they are ready to take all that the new year brings. Yup, that’s right, this is a crazy busy time for your hairdresser and beautician too. Leaving straight from the office to drinks/dinner/parties happens more at this time than any other, so it is at this time more than any other that you need to bring (feel) your A-Game. Book in your beautification appointments early to secure your spot and it will be one less thing you need to worry about! and hey, who doesn’t love the head massage at the hairdressers!? #selfcare is super important at this time too. These are just a few ideas to get you ready for the Christmas Holiday Period, the idea is to start the new year on the right foot and enable you to “disconnect to connect” over this period. If you have some ideas that you would like to share we would love to hear them.